Summer is just around the corner and Madrid is getting ready! For our June Blog we want to share with you the best swimming pools in Madrid and also the natural swimming pools just outside the city. Ready to splash around and get a tan? Keep reading for the complete list of pools for those who love the water and spending time outdoors. This huge sport center has been built in 1930 on top of the first water deposit of the city. In 1985 “Canal de Isabel II” (the company in charge of supplying water for the city of Madrid) and the Community of Madrid have signed an agreement that allows citizen to enjoy this area as a recreational spot. The area takes up a surface of about 40.000 m2. The main complex includes the swimming pool, a gym, a tennis- and paddle court. The other part has two soccer fields and one indoor soccer facility. We definitely recommend this spot for athletes and sport lovers. This sport center opens from Monday to Sunday from 08:00 to 22:00 and it costs 5,50€ to get in. You can also get a pass for 10 times for price of 50€. This swimming pool is located within walking distance from Mad4You Hostel, in the area of Malasaña, Madrid city center, and it is an indoor pool. They organize plenty of classes such as swimming lessons, water aerobics and water Pilates and even have a sauna! It is open from Monday to Friday from 07:00 to 23:00, Saturday from 8:00 to 21:00, Sunday from 9:00 to 19:00 and the entrance fee is only 5€ per person. This park is located a bit outside of Madrid, but we believe it is definitely worth a visit! 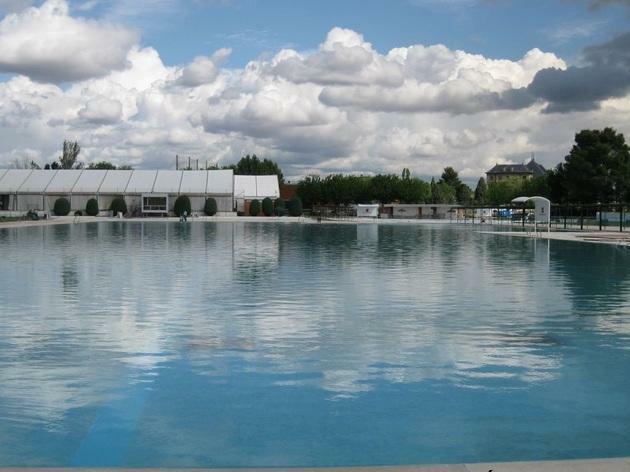 With its 300.000 m2 of green, it is the biggest outdoor swimming pool of Madrid. One can play golf, tennis, archery, and even rugby and rafting. The swimming pool area is massive (more than 130 m2 large) and it is even one of the biggest in Europe! Perfect for a relaxing day in the sun with your new Hostel friends! Getting there only takes 45 minutes from Plaza del Callao: take the bus number 133 to Mirasierra and get off at the stop Parque Deportivo Puerta de Hierro. Entrance prices may vary depending on what activity you will be doing. 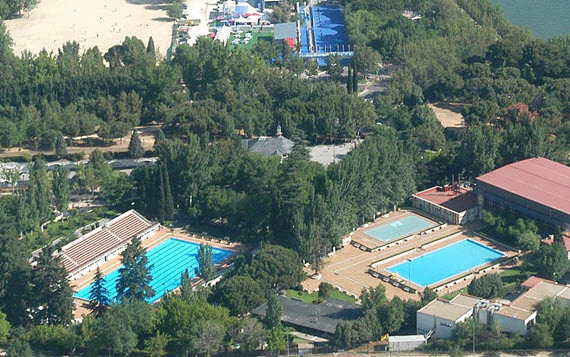 It is considered the “beach of Madrid” as it is the only natural water source of the city where swimming is permitted. Also, it has a beach line of more than 10 km. Do not forget to visit the Cerro de San Esteban (on the right side of El Pantano de San Juan) where you can hike and reach a point with a breath-taking view of the water. Some say there are rupestrian paintings nearby, let us know if you find them! If you feel particularly outdoorsy you can spend the weekend here, as there are camping facilities in the area. To get there: from metro- and bus station Principe Pio you need to take bus number 551 departing from Gate 22 (Cevesa bus Company). It takes approximately one hour, and the bus will drop you off 15 minutes walking distance from the Pantano, and the last bus back to Madrid goes at 22:00. This area is only 2 km away from Madrid city and it is a little green paradise, ideal for the hot summer days. The view of the surrounding hills is spectacular and even if it can get a bit crowded, there is plenty of swimming space for everybody. To get there, take the bus number 191 from metro- and bus station Plaza de Castilla. If you require any other information or have question you can always contact us at info@mad4youhostel.com or chat with our super helpful and knowledgeable staff once at the Hostel! Hope to see you soon at Mad4You Hostel to enjoy the summer of 2018 together!